There is a certain latitude in the definition of the two words Jacky Lansley uses for her new work: About Us. Who exactly is ‘us’ and, depending on the answer to that question, what is it ‘about us’ that is the subject of the work? On one level, ‘us’ refers to the eight performers (six in the theatre and two on film), whose personal stories form the initial structure of the work. As Lansley writes in the program about the research process, ‘…I invited each of the performing artists to bring a story to the studio that was joyful, distressing or mundane. 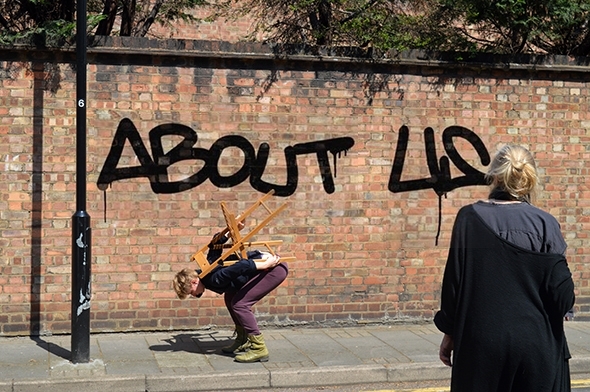 These stories were then explored through a range of physical and vocal disciplines to create live performance material…’ The stories value the ordinary and the everyday that Lansley then interrogates with a ‘wide range of visual, choreographic and conceptual stimuli’ to reveal their deeper significance. At the heart of the process is her conviction that ‘the personal is political’ and she links the two by applying refractive filters to the stories that through suggestion, analogy, parody or juxtaposition generate a construction of underlying themes and observations that emerge as a layered image of what we might call contemporary British society. Thus, by way of philosopher Jean-Luc Nancy, the singularity of the eight performers’ experiences becomes the plurality of ‘us’ not in the sense of a self-regulating, enclosed group but as an open and imaginative relation of the individual to others. Entering the theatre — a large rectangular area with two parallel lines of chairs facing each other across the performance space and at either end — we notice some of the chairs are already occupied by the performers (you can guess they are performers because Fergus Early is sitting in cricket whites holding a bat and Esther Huss is wearing sunglasses). Projected on the wall on either side is a reminder of the work’s inclusive premise, the word ‘Us’. The sound score by Sylvia Hallett is like a stave on which the performance is threaded, for she has taken the voices of the recorded oral stories as a starting point for her composition. When we see and hear Ingrid MacKinnon (and her son, Max) on film, her dialogue is a coherent whole but with performers Huss and Jreena Green, Hallett takes a single phrase and repeats it as a musical riff on which the choreography is based or, in the case of Tim Taylor, composes his thoughts into a song in the style of Noel Coward. And is it fanciful to hear in her electronic treatment of Early’s rhythmic tapping of a bat in its crease the extrapolation of cricket’s colonial legacy to the rattle of a machine gun? Roswitha Chesher’s beautifully filmed sequences, like Hallett’s score, move from the straightforward (interviews) to the surreal (Fergus and Ursula Early hissing and growling) to the delightfully frivolous (portraits in stylish hats). She films a tennis match that is reminiscent of the mimed game in Antonioni’s Blow Up but here represents a cultural environment of rules, sportsmanship, cooperation and competition that in the context of the great current leveler, Brexit, seem to have lost their meaning — or are perhaps in the process of searching for a new one — which makes the very question of ‘us’ even more relevant. In one sense, About Us coalesces around this country’s ongoing political and social unrest and how individual circumstances feed into it. The value of artistic means is that they can make ‘us’ (in Nancy’s sense) think deeply through the imagination, and Lansley shows us to what extent the personal is political. At the same time she suggests the role of choreography, as both a mirror of the tangled web of cause and effect and as a means to resolve it, is an appropriate metaphor for a way forward. As dramaturg Ramsay Burt asks, ‘Are we perhaps choreographing hope…?’ The final section, however, goes far beyond this current political quandary to embrace the very survival of the planet. The original stories give way to projected statistics and quotations that form a didactic panorama about endangered species — not least about our own. Even if it’s still ‘about us’, the very enormity of the scope dwarfs the original frame of the work; how can these personal stories connect to the impending extinction of the planet as we know it? Although there is a connection — Lansley points out that Britain’s colonial legacy includes the recreational hunting for wildlife trophies that has escalated into trafficking for profit — it seems the creative archaeology of the personal experience has suddenly been appropriated by an intellectual endgame. It’s as if an umpire, instead of allowing the players to reach their own result, has imposed on the game a prearranged conclusion. How ironic that this sounds like the mandate for Brexit.